Tools are a necessary part of running a business and making the hustle easier. BUT you don’t need ALL the tools and shouldn’t be too quick to hit buy. 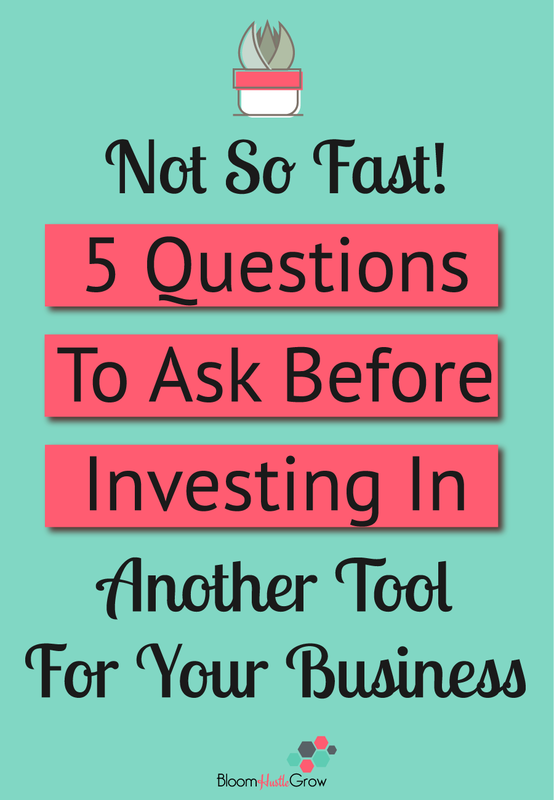 Investing in tools for your business can add up fast if you aren’t mindful of what you are choosing to invest in (much like with spending money any other way too). Invest in tools when you are ready. Sure you might have jotted down some notes for a course but until you are ready to get down to course creation and launching you don’t need to invest in course host. Creating a course is a lot of work, and you don’t need Thinkific or Teachable (or whatever) to create the outlines, the materials, the videos, or the promotions. Save yourself a month or two in payments. Are you using tools as a procrastination technique? So on the flip side of buying tools for someday, sometimes we use tools to stall someday. For example, “I’m going to start my email list when I find the right system”. NOPE, there are plenty of systems readily available; you need to choose one and get started. Want to see all the tools I use to run my business? Related to this one and what I also find is another procrastination technique is next. Why do you actually need to switch? I often talk to entrepreneurs about tools in conversations, and someone will say, fairly excited when someone brings up a new tool, OH maybe I need to switch! Again, business changes, technology changes, it’s good to change BUT only if you need to. Switching just because something is new and shiny is a total waste of time. Before you invest in a new system (time and money), you must be able to say WHY you need to switch. I always ask, what are you currently using now and what do you not like about it? If you can’t tell me what you want that your current tool does not have, girlfriend it’s just shiny object syndrome. Does it fit your budget and your use frequency? There’s a fine line between wasting time and wasting money when deciding to invest in tools. Just because a tool can do something you “need,” doesn’t mean you need that tool. On the flipside, just because you can manually do something doesn’t mean it’s worth your time doing it versus investing in a tool that will save you that time. There is also the middle ground of finding workarounds or free solutions, and how much time does that will take. If you have no plans for a tool beyond needing it just for that one-time thing, it’s probably worth the time to see if you can’t find a workaround. If you know this is something you have to do every week and a tool will make your life easier, it might be time to invest. Do you need all those features? Just like you have a target audience for your business, people who create tools design those tools for certain business/industries. And while a tool might seem very popular in your same industry it doesn’t mean it’s right for you. You can easily overspend and waste money by investing in tools that have a ton of features, none of them you are ready to use. Many tools/apps account for this by offering tiers of features, just make sure you are doing your research and taking advantage of what you are paying for. More features don’t mean more bang for your buck. Speaking of features, technology is always changing, prices are changing, and your business needs are changing. To make sure your tools are keeping up, I highly recommend conducting a tools audit, every six months to 1 year. Having a list of tools you have + evaluating regularly will help make sure you are getting the most from your tools. Grab the tools audit kit to get started!